Giants' fever is here and it has infected our food. Restaurants across the Bay Area are jumping on the biggest meal ticket in town and creating delectable homages to the hometown team playing for baseball's biggest prize starting Wednesday. From cupcakes to milkshakes to Gigante dogs, there is something for everyone. For a quick rundown we can start with Kara's Cupcakes and Susiecakes who are serving up Giant themed cupcakes. 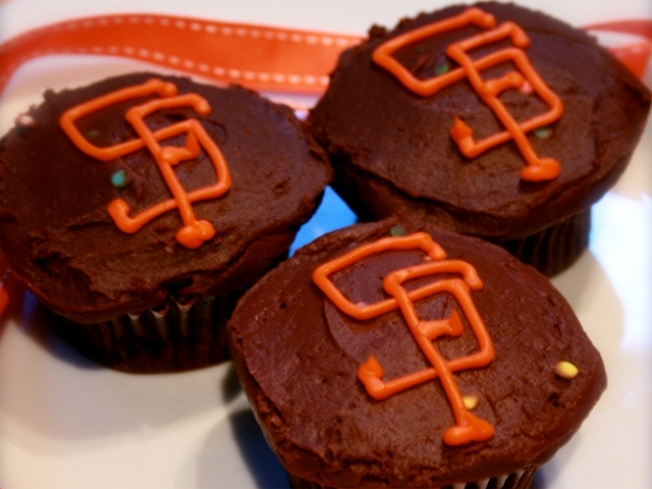 Kara's is going to be nice enough to give out 25 free cupcakes at each of its locations to anyone who comes and say Go Giants. And then at its Embarcadero location, the store will give out 500 free Giants cupcakes between noon and 1 p.m.
Campbell's Psycho Donuts has a special batch of playoff pastries for the Giants. Susiecakes is doing its part by spreading anti-Rangers cupcakes across the Bay Area and others with Pandas on them and even more with Brian Wilson "fear the beard" inspired sweet cakes. Psycho donuts in the South Bay is also going crazy for the Giants. For those looking for something a little more hearty to go with their giant cup of Giants' fever, head down to 4505 Meats in the City, whose owner is offering the World Series delux, which comes with six Gigante dogs. Several restaurants in the City will open their doors early to Giants fans who can't afford to pay the exorbitant prices. Some like Hogs & Rocks, Patxi's Chicago Pizza (because the Cubs never make it) and American Grilled Cheese Kitchen are offering special deals for fans to help absorb the sticker shock of the series.